This is not your average Jollof Rice. This right here is a game changer. The rice is cooked together with ingredients in an oven. 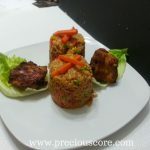 The result is a great tasting Jollof Rice! The best part is the process is so easy! 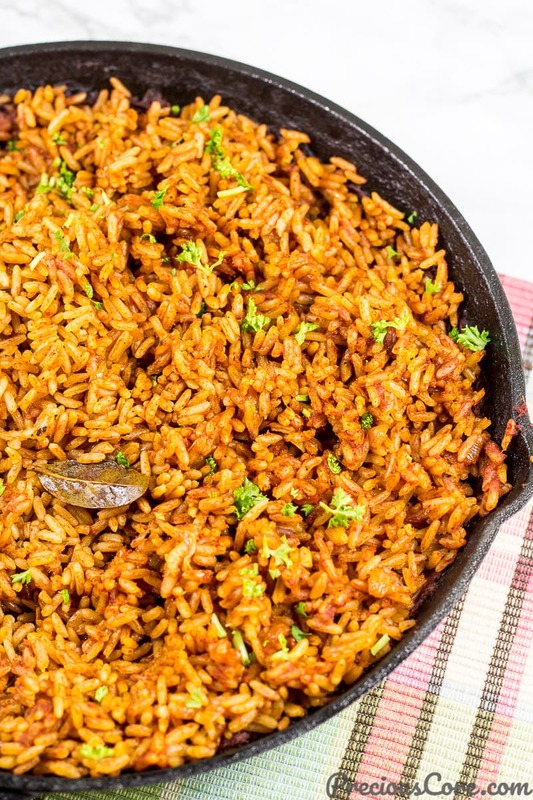 Read on for directions on how to cook Jollof Rice in the oven. 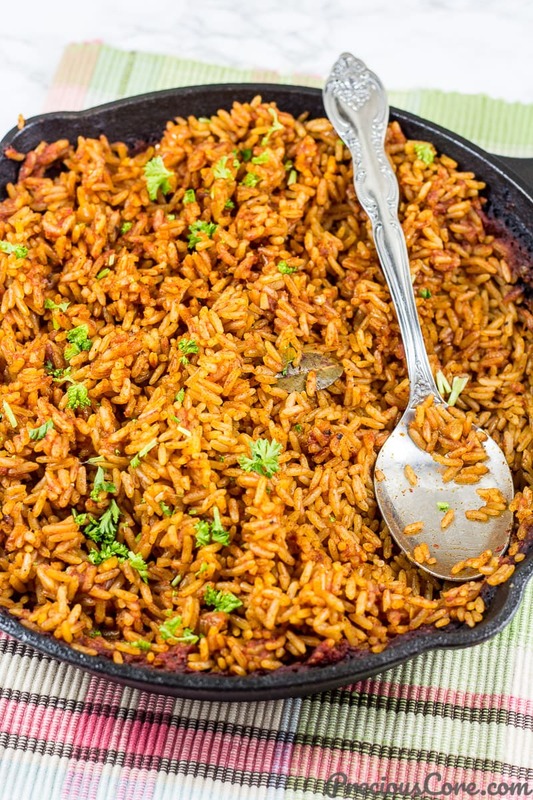 You guys, our beloved Jollof just got an uplift. 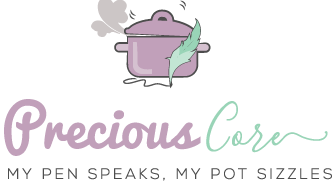 Are you so busy but you want a good home-cooked meal? 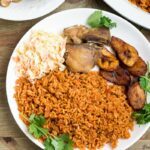 Do you want to enjoy Jollof but without all the hassle? Do you want to enjoy an African meal that is vegan? This recipe is for you! 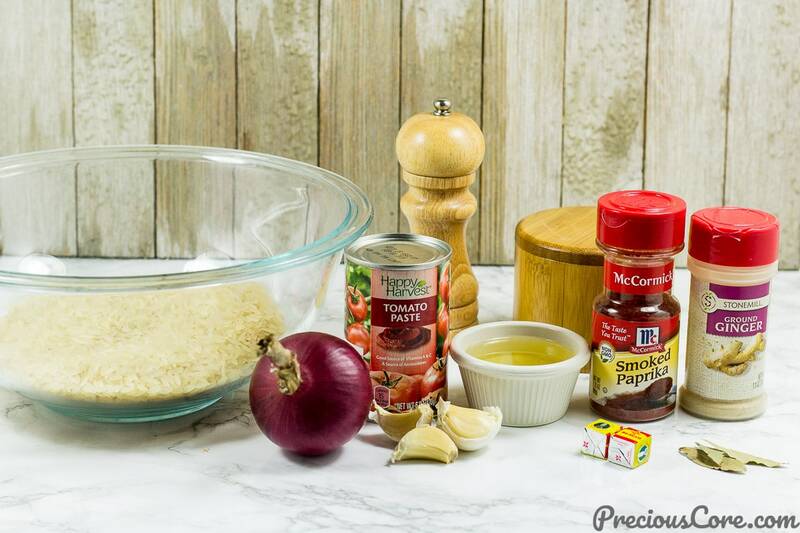 The ingredients are pretty simple: parboiled rice, tomato paste, oil, garlic, ginger, bay leaf, white pepper, oil, Maggi, salt and smoked paprika (optional). All you need to do is saute the onions and garlic on your stove-top then add the tomato paste and stir, then add in the rest ingredients, cover with aluminium foil and stick that into your oven. Then you relax and let the oven do all the work, baby! You guys, this rice is so easy and it equally tastes ah-mazing! It is perfect for this season when kitchens are busy! 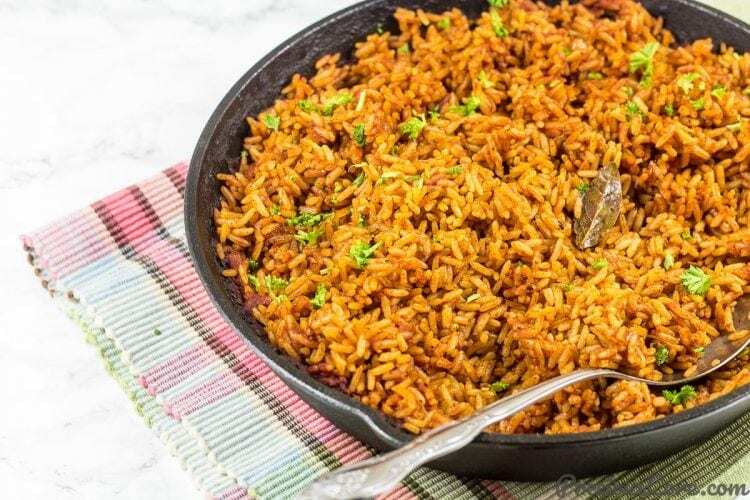 If you have so much to cook in this season, you could totally make some Jollof Rice in the oven to entertain guests with or to enjoy at home! Feel free to double, triple or quadruple the recipe as needed. I made a video to show you guys how to cook Jollof Rice in your oven. Hope you enjoy watching and if you do please subscribe to my YouTube channel so you never miss any of my cooking videos. 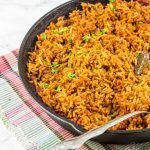 West African Jollof Rice made in the oven with big flavors. 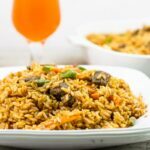 This is Jollof Rice made easy yet it is so tasty. Heat up oil in a cast iron skillet on medium heat then saute onion and garlic until fragrant. About 2 minutes. Add tomato paste and cook stirring constantly for 5 minutes. Add in 3 cups of water gradually and stir well. Add ginger, paprika, white pepper, bayleaf, salt and seasoning cubes. Mix well to combine then add in the rice and mix well. Cover the skillet with aluminium foil and place in pre-heated oven. Bake for about 45 minutes. Remove from oven and let it rest for 5 minutes. Fluff rice with a fork and garnish with freshly chopped parsley. 1. If you like heat in your food, be sure to add in some ground habanero pepper or chilli pepper before sticking your rice in the oven. 2. It is important that you use parboiled rice as mentioned in this recipe together with 3 cups of water. If you choose to use another kind of rice then you need to adjust the amount of liquid to suit the kind of rice. 3. 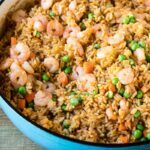 You could add vegetables like chopped carrots, green beans or peas to your rice and mix as soon as it is out of the oven. 4. This is a vegan dish when eaten on its own. However, I love serving it with some grilled chicken. Nice one dear. Thanks for these wonderful secret. What can be used in the absence of aluminium foil? Hi Prince, you could use an oven-safe lid instead. Wow! Cooking rice in the oven. A great secret revealed. 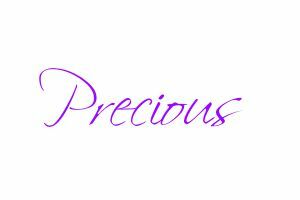 Thank you for sharing, Precious. Awww so good to know. CAN you make ahead day before and then cook the day of the party? Thanks Precious, I’m learning to cook African dishes from you no more spending all of this money eating out and microwave dinners. So glad to help, Clarence! Thanks for your feedback. Did you say NOT to rinse the rice. If so, why? I’ve always been told to do so, but would love to know if there are specific times when I shouldn’t. Hi Rowan, great question! Parboiled rice which I used in this recipe doesn’t really need to be washed before cooking. Hi Miranda, any long grain rice will work here. Please let me know how it goes, Beckline. First, thank you so much for your wonderful recipes. I am learning a lot from you. Can I add hot chilli to the rice or is the white pepper hot enough? I haven’t used the white pepper before so I don’t know if it’s spicy/hot at all. Hi Jane, definitely add hot chili is you want it spicy. 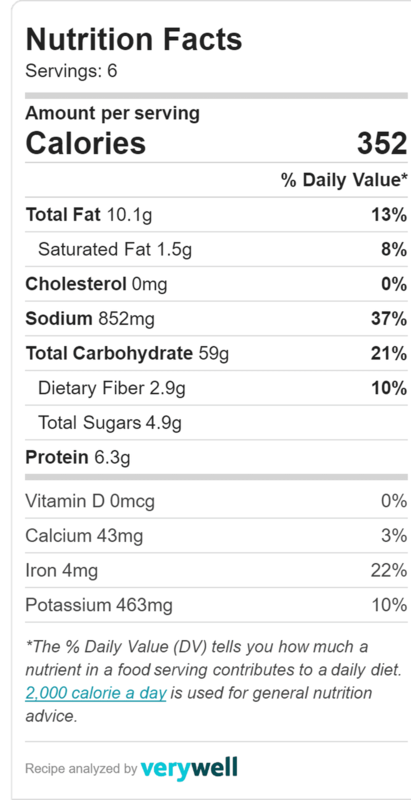 White pepper adds more of flavor than spice. So glad the recipes are helpful.